The sea calmly lashed along the shoreline of a bay nestled amidst two rocky shores. A fort of old rests as a wave-breaker in the middle of the curves. The bay serves as a jetty for hauling the catch and the beach serves as a landing port, from where the catch is auctioned. 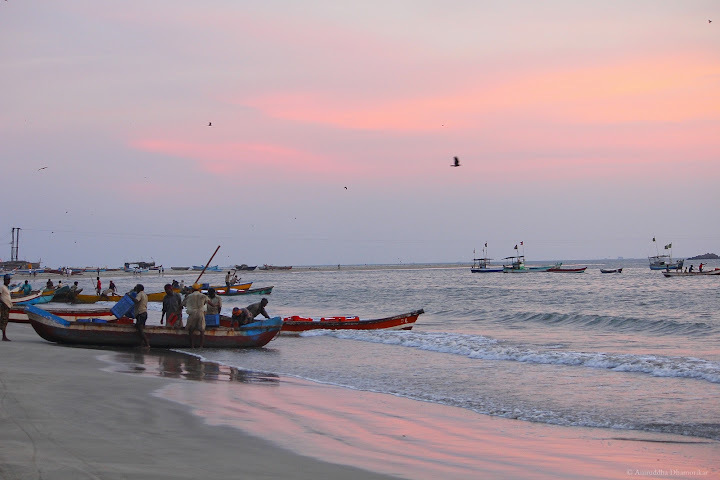 The fishermen set out once at night after dinner, and once at noon, trawling the waters sometimes at a stretch of two to three days, until they turn back to the jetty to sell off the catch and reload for another expedition. And this goes on every day until the season of Monsoon when fishing is closed (up to one or three months). 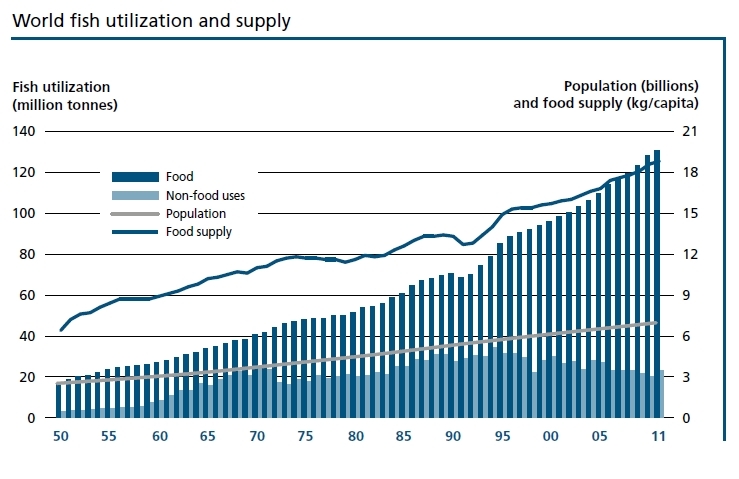 As the graph suggests, not all fish caught or bred is utilized for food: It is also fed to the food we eat. It is also fed to the plants of whose fruits we eat, in the form of fertilizers. But I will not blame you for it if you’re vegetarian, for most of us never know what we’re eating was fed with. But I will take you through the deep and dark lanes of fish trade, fish discards, and the threat bequeathed upon traditional fisherfolk. Slowly and suddenly women gather in groups and settle the benches, sharpen the knives, and reopen the last evening’s catch for early buyers. And while people busy themselves with the smell of the stale fish in a soup of melting ice, hand-driven boats lodge themselves along the sandy shore, their hull full of fishes – some silver as a sword, spotted as a leopard, some red as blood, gasping for air, alive. Then ice trucks arrive, carriage cars arrive, and bucket-loads of fish are loaded onto the trucks. The excess is laid out upon the sand. Cats circle in pairs, kites hover in dozens, and men yell numbers illegible. 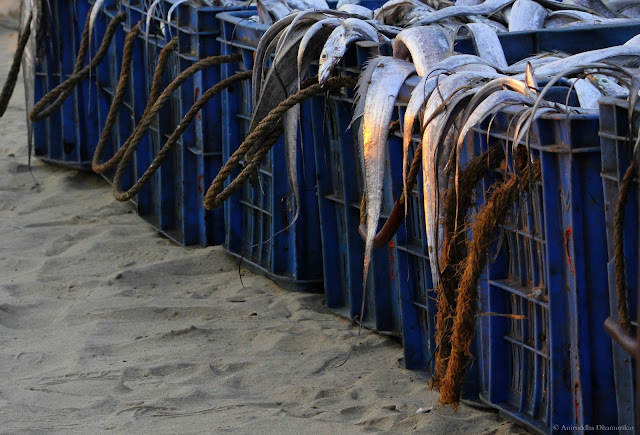 Most of this catch consists of Ribbon Fish, species of Skate, Indian Oil Sardine, and most are auctioned right at the beach. These fish are bought either by hoteliers or by local fish sellers. The auctioneer however is not always the fisherman – he is the contractor who probably loaned the fishermen to buy the boat. And the catch is sold to him at a fixed price even before they fish it. Whatever profit the auctioneer makes as the middleman remains in the middle. One of the catch that got buried in the market stampede was the one I felt most miserable for. A Black-tipped Reef Shark came wrapped in a cloth, was unclothed, and laid on the ground. It was a young female with gorgeous cat-eyes, a smiling face if she were alive, and a menacing row of needle-sharp teeth. She was not more than mori meat now. No one knew if she was Threatened, no one knew how big she would have grown, no one knew if she was a female or a male. She was mori masa (shark fish), and that meant food. Sharks such as this, the Hammerhead Shark, and even Whale Sharks, are consumed as a delicacy. 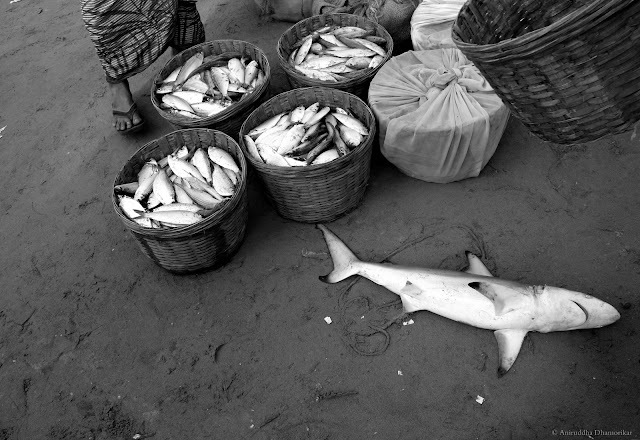 Like the tiger prawns and plain prawns, or silver promfet and black pomfret, sharks come in as a shark. The apex predator of the seas is simply stripped of its title. Around the world, hunting of sharks is looked down upon. Yet those who eat, eat it openly. The reason why sharks, endangered or not, are hunted relentlessly is because there is a huge demand for shark meat. Whether it is shark-fin soup or shark-meat curry, many relish it. In India, shark meat, or as it is locally called here, mori mutton, is openly sold as mori mutton in all the hotels. If you are a fan of mori mutton, you’re responsible for fishing of the endangered ones more than the fishermen. Hunting sharks, especially when they’re so young, is akin to poaching of tigers and their cubs. And just like poaching, it is the buyer who is responsible for demanding the meat. However when it comes to the seas, we’re either too ignorant of the plight of the world we cannot see with our bare eyes, or we’re too involved in the taste of the seafood we eat. And what we want to eat is over-fished. According to the State of World Fisheries and Aquaculture 2012 report, there was an average growth rate of 3.2 percent per year in the period 1961–2009, outpacing the increase of 1.7 percent per year in the world’s population. And the reason behind all this is one: demand. In the state of Maharashtra alone, the fish production is to the scale of 420,000 tonnes (2003-04 figures), and according to the report Illegal Unreported and Unregulated Marine Fish Catches in the Indian Exclusive Economic Zone (2010), the average discards are to the scale of 90,037 tonnes. This number is higher for the states of Kerala, Tamil Nadu, Andhra Pradesh, and Karnataka. So for every kilogram of fish you and I eat, 0.21 kg of fishes are killed and thrown off the boat, or turned into fertilizers, as discards. The debate between traditional versus non-traditional methods, non-mechanized versus mechanized, have been raging for several decades now. Earlier, when mechanized fishing was introduced at lucrative subsidies and people then who could afford left behind the traditional ways in the hopes of a larger catch, and, a larger bounty. As years rolled by, the impacts of the then-introduced trawlers and purse-seines impacted the catch of traditional fishermen who could not leave the shores. A rebellion evolved out of the frustration – out of hunger – and today there is a stark similarity between the two types of fishing – the fish catch has significantly reduced. One of the harsh realities of over-fishing was published by Boston Big Picture, “The Last of the Trawler Men”, on April 5, 2013. The story remains the same, but the story of every individual fisherman, mechanized or not, tells a different tale. They are not responsible for over-fishing the waters. They are not responsible why I so fear to be a fish. We are. You and I. Seeing the fish struggle in a catch, and catch the last breath as they are hauled onto land, and at the same time seeing the fishermen heaving and struggling to keep up with the demand of the consumers, is a battle that is going to strip either the privilege of living the free life. 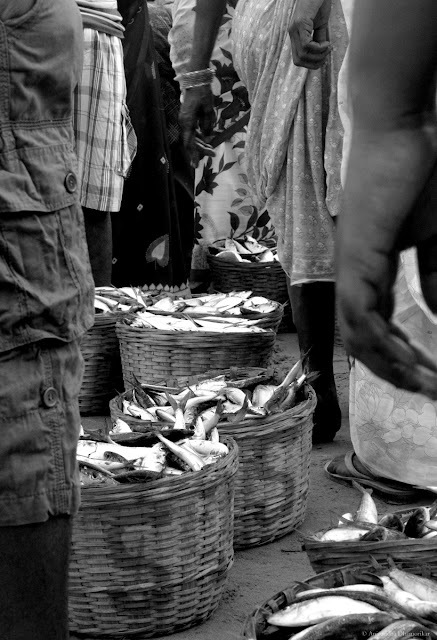 As a consumer, our role in the food-web is far more crucial than we consider it, for we hold the reign of several species in our hands – including that of our fellow fishermen, for the demand comes from us, and if it increases, we deplete the resources, and if it stops, we deplete the source of income for over 38 million fishermen, the associated occupations not accounted for.